Rose gold-tone stainless steel case and bracelet. Fixed rose gold-tone bezel. Mother of pearl dial set with one rows of crystals with rose gold-tone hands and index hour markers. Roman numerals mark the 3, 6 and 9 o'clock positions. The Emporio Armani logo appears at the 12 o'clock position. Dial Type: Analog. Quartz movement. Scratch resistant mineral crystal. Pull / push crown. Solid case back. Case diameter: 32 mm. Case thickness: 8 mm. Round case shape. Band width: 14 mm. Deployment clasp. Water resistant at 30 meters / 100 feet. Functions: hour, minute. Casual watch style. 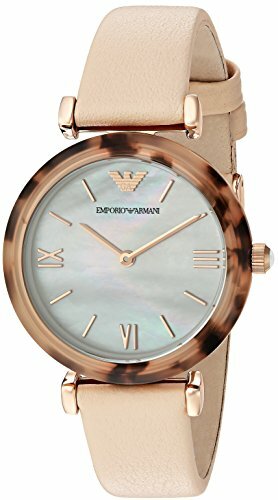 Emporio Armani Classic Mother of Pearl Dial Rose Gold-tone Stainless Steel Ladies Watch AR1909. 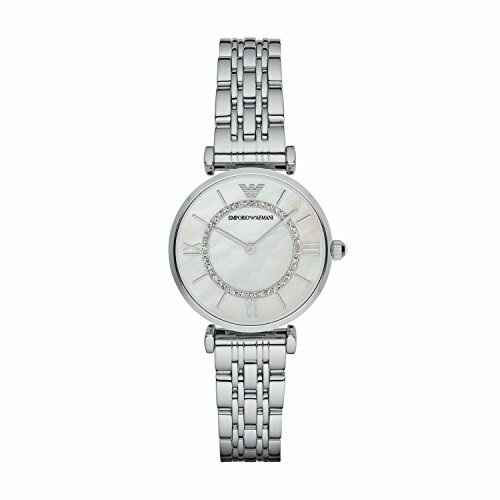 Emporio Armani AR1908 is an amazing and attractive Ladies watch. Case is made out of Stainless Steel, which stands for a high quality of the item and the Mother of pearl dial gives the watch that unique look. This model has got 30 metres water resistancy - it can be worn in scenarios where it is likely to be splashed but not immersed, so can we worn while washing your hands and fine in rain. We ship it with an original box and a guarantee from the manufacturer. Emporio Armani AR2508 is an incredible attractive Ladies watch. Material of the case is Stainless Steel while the dial colour is Mother of pearl. 30 metres water resistancy will protect the watch and allows it to be worn in scenarios where it is likely to be splashed but not immersed, so can we worn while washing your hands and fine in rain. The watch is shipped with an original box and a guarantee from the manufacturer. Gold-tone stainless steel case and bracelet. Fixed gold-tone bezel. Mother of pearl dial with gold-tone hands and index hour markers. The Emporio Armani logo appears at the 12 o'clock position. Dial Type: Analog. Quartz movement. Scratch resistant mineral crystal. Pull / push crown. Solid case back. Case size: 28 mm. Case thickness: 8 mm. Round case shape. Band width: 8 mm. Fold over clasp. Water resistant at 30 meters / 100 feet. Functions: hour, minute. Additional Info: in general, withstands splashes or brief immersion in water, but not suitable for swimming. Dress watch style. 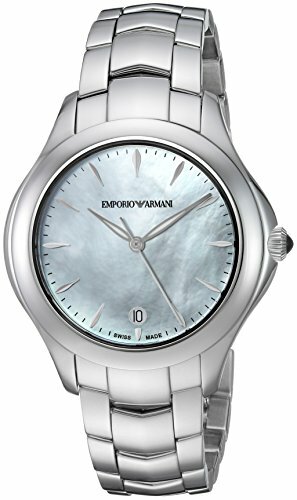 Emporio Armani Dress Mother of Pearl Dial Ladies Watch AR7417. 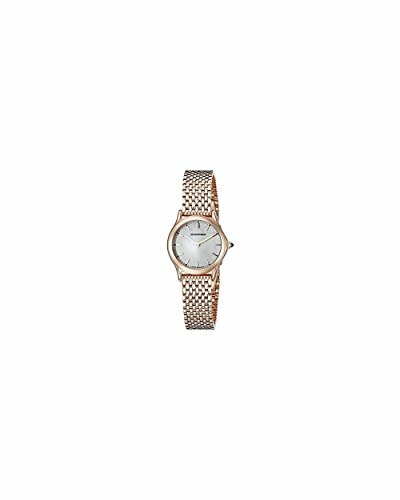 Rose gold-tone stainless steel case with a rose gold-tone stainless steel bracelet. Fixed rose gold-tone stainless steel bezel. Mother of pearl dial with rose gold-tone hands and index hour markers. Minute markers around the outer rim. Dial Type: Analog. Quartz movement. Scratch resistant mineral crystal. Pull / push crown. Case size: 24 mm. Round case shape. Deployment clasp. Water resistant at 30 meters / 100 feet. Functions: hour, minute, second. Dress watch style. 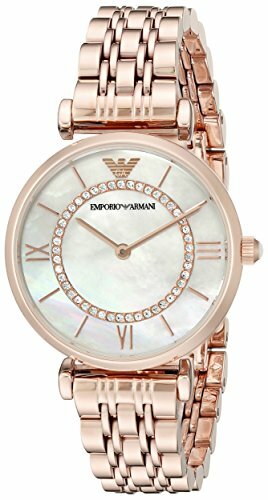 Emporio Armani Mother of Pearl Dial Ladies Watch ARS7204. 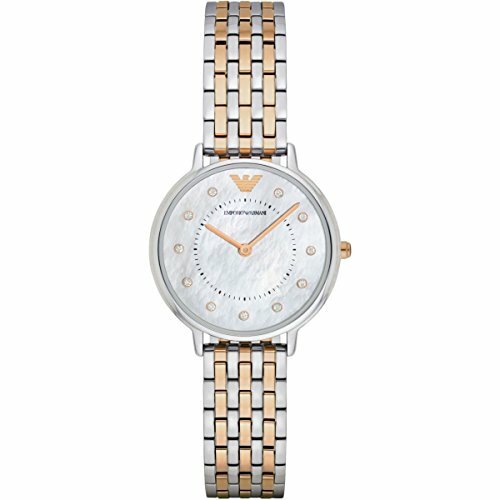 Copyright © Wholesalion.com 2019 - The Best Prices On Emporio Armani Mother Of Pearl Dial Watch Online.